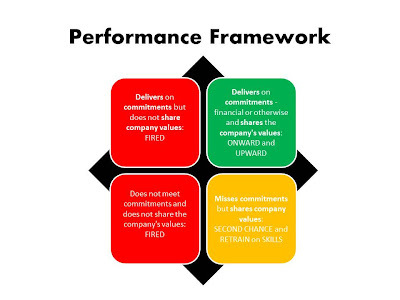 A recent article When to Fire a Top Performer on the HBR Blog Network by Eric Sinoway caught my eye. In the article Eric classifies employees into four categories based on their performance and their alignment with the organisation's values and culture. Stars are the employees we all love — the ones who "do the right thing" the "right way" . High potentials are those whose behavior we value — who do things the right way but whose skills need further maturation or enhancement. With training, time, and support, these people are your future stars. Zombies fail on both counts. Their behavior doesn't align with the cultural aspirations of the organization and their performance is mediocre. Vampires are the real threat. These employees perform well but in a manner that is at cross-purposes with desired organizational culture. The 'Vampires' as Sinoway calls them can cause untold damage to your organisation, despite the appearance that they 'get results'. Reading the article reminded me of a framework I had learned from Jack Welch while he was CEO of GE. In this matrix, the vertical axis refers to 'on the job performance and the horizontal axis refers to alignment with company values. Welch argued that so called high performers who didn't align with company values hurt the company in the long term, despite their short term 'performance' results. Welch's view was that these people damaged both internal and external relationships and as such would damage the company in the long term, which is why he fired them. Folk who were aligned with the company's values but fell short on 'performance' were worth a second chance. Of course those who scored well in both areas were the company's stars and should therefore be promoted and their opposites, those who neither 'performed' nor shared the company's values were asked to leave. The beauty of these models and approaches is that they provide us with a framework for conversations and decision making. How does your organisation manage the dilemma of a high performer who doesn't align with the company's values?